My first cinema trip of 2012, and this film provoked quite a conflicted reaction. From the trailers the film looked to be an interesting biopic of the infamous Margaret Thatcher, a woman who led a fascinating life from her relatively humble beginnings as a grocer's daughter growing up in Lincolnshire, to Conservative Prime Minister during a turbulent eleven years of British history. Undoubtedly this in itself is ample material for an interesting film, however what the trailer does not prepare audiences for is the manner in which the story is told (luckily I had been forewarned). The film focuses not only on this woman's political career, but also on her mental decline, and her descent into dementia. In fact, the story of this woman's rise to power is told in dementia fueled recollections, providing us with a narrative which moves smoothly between the key moments in Thatcher's career and distressing scenes of a woman losing her grip on reality. As a sensitive viewer, it was an interesting experience, and one which I'm not quite sure about. 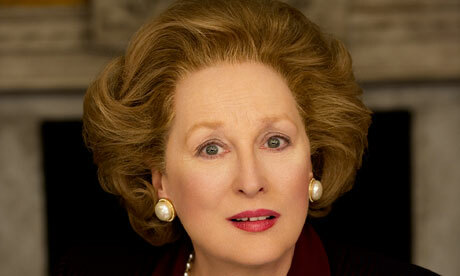 The film opens with the elderly Thatcher (Meryl Streep) venturing out unaccompanied to buy a pint of milk. It soon becomes clear that she is unclear on what is happening, with Denis Thatcher (Jim Broadbent) appearing throughout, to variously talk to and torment the frail old lady. We then begin to see key moments in Thatcher's life; as a young woman listening to her Father speak as a Conservative Party Member, through her time at Oxford (she won a scholarship), and her marriage to Denis. The performances are excellent and Streep is particularly outstanding. Her portrayal of the somewhat stern politician balanced against a vulnerable elderly woman, is impressive. It is in part by virtue of her performance that the scenes with the elderly Thatcher are as distressing as they are. However, director Phyllida Lloyd's use of point of view shots, juxtaposed against high angle shots provide an unbalanced view, which articulates Thatcher's mental decline quite horrifyingly. With the exception of the opening scene the elderly Thatcher spends her time in a large grey empty house, giving a sense of her isolation. These directorial choices are powerful, especially when contrasted with the colourful scenes of Thatcher's past. However, it left me feeling quite confused about how I was supposed to feel. I am too young to remember the Thatcher years, so can remain relatively unbiased. I will admit to admiring her tenacity in becoming the first female Prime Minister against all odds, but I also know about the spending cuts, 'non-contributors', and The Falkland Islands. Thatcher haters should be appeased that the film presents her dogged desire to make Britain great again, arguably at the cost of the poor. We also catch a a glimpse of Thatcher as the bully, and witness her desire to humiliate other conservative party members; in the film this is portrayed as a sort of misplaced desire to assert herself on the same footing as the men. This film does offer us these key events and aspects of her character, but from someone interested in learning about the history of the period, it is not as comprehensive as I would have liked. I understand that this was a deliberate choice, and according to Lloyd, the film is inspired by Carol Thatcher's own published memories of her parents. “There’s one very touching episode when she first realizes her mother is struggling with her memory. That was one of the igniting sparks for Abi Morgan’s decision to set the film in the present day and to do a film which was not a biopic, not something which tries to anatomize her policy, but a film about the cost of a huge life and a kind of reckoning with it." However, this choice opens the film up to controversy. Let me be clear. I do not believe it was a bad choice to portray this very human side of Thatcher in decline; I actually think it was an inventive way of approaching a film about a woman who continues to remain controversial today. However, I will say that I question the decision to release such a film prior to Thatcher's death. No matter how much people disagree with her rigid Conservatism, it is still a decision which should be questioned as a matter of sensitivity to her family. It is also questionable because it suggests we view the old and infirm as already dead.